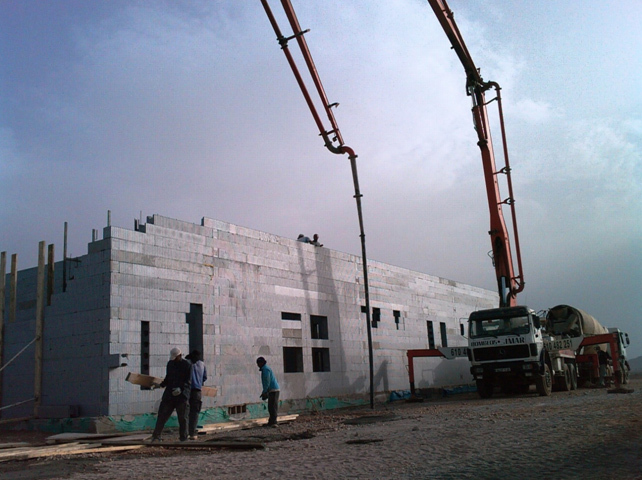 Experienced contractors can fill our elements even to the height of 5 m! 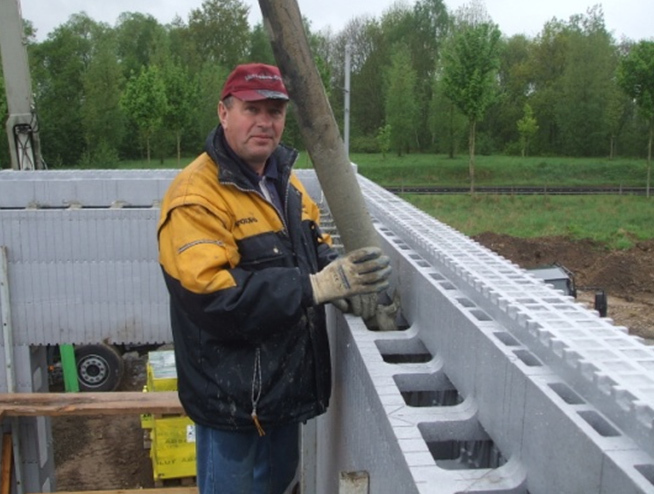 The walls can be concreted with a pump, hopper lifted by a crane or manually. 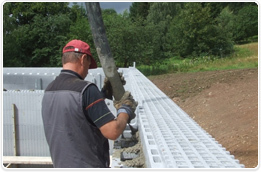 This is the fastest concreting method and currently the most popular among the professionals. 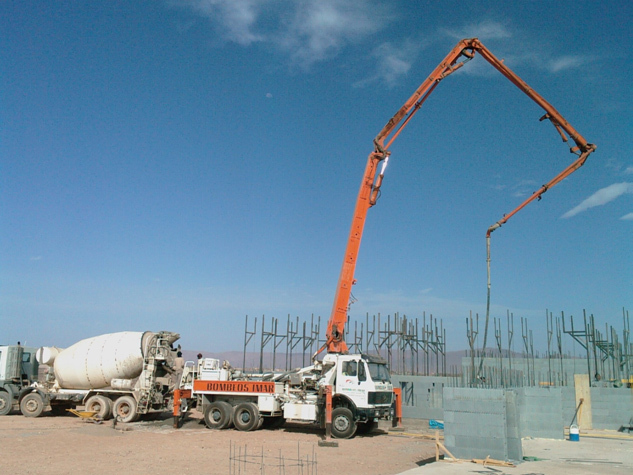 When the elements are stacked to the height of the storey and the formwork is supported with special supports, you can start pumping concrete. Pour the concrete in a "circular" manner, i.e. 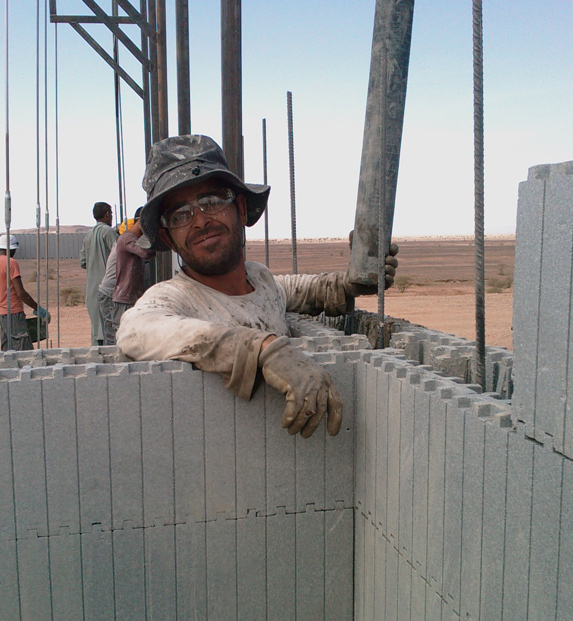 fill the formwork to the height of 1 m in one place and then move slowly forward. After 2 or 3 "laps" the walls will be filled. 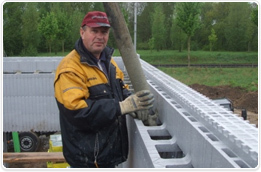 Feed the concrete at a 6-8m3/h rate. When you use the forms with the 30 g/l density, you can be sure that they will not break under the concrete hydrostatic pressure. 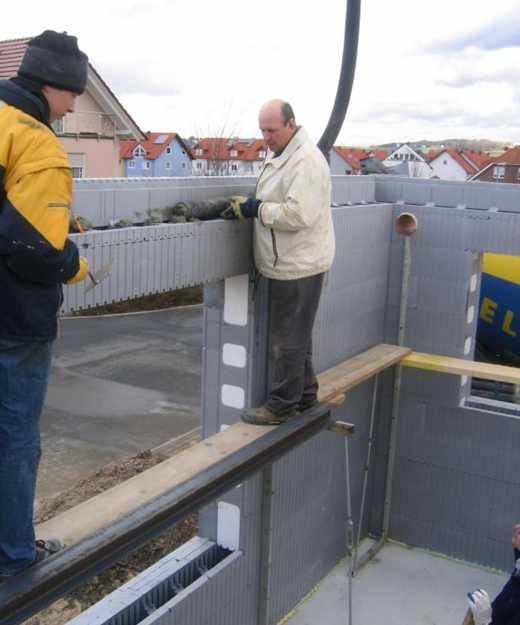 Experienced contractors can fill our elements even to the height of 5 m! Perfectly designed locks which connect the elements ensure that they do not detach and it is not necessary to use clamps which are required in other, less advanced solutions. 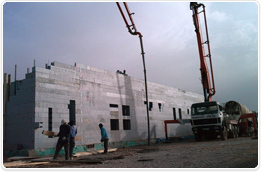 The supports to stiffen the formwork during the concreting can be bought or rented from Izodom. 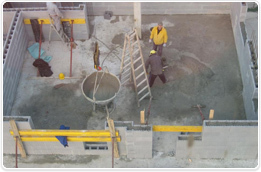 Use the dense-plastic concrete (consistency 27-14s according to VEBE method) with minimum water content, and with plasticizers for good filling and short drying time. Maximum aggregate grain size is ø 8mm. Larger grains would result in blowholes in the wall. Do not use internal vibrators to vibrate the concrete. Use manual rodding, external surface vibrators or just put a plank to the elements filled with fresh concrete and hammer it. When erecting tall buildings and when a crane is available on site, the contractors decide to use a hopper. 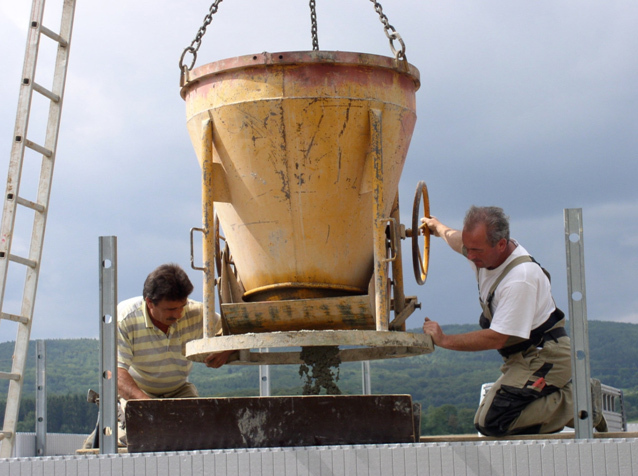 When the hopper is lifted to the suitable height and led to the correct place by the workers, the bottom is opened and the concrete is poured. 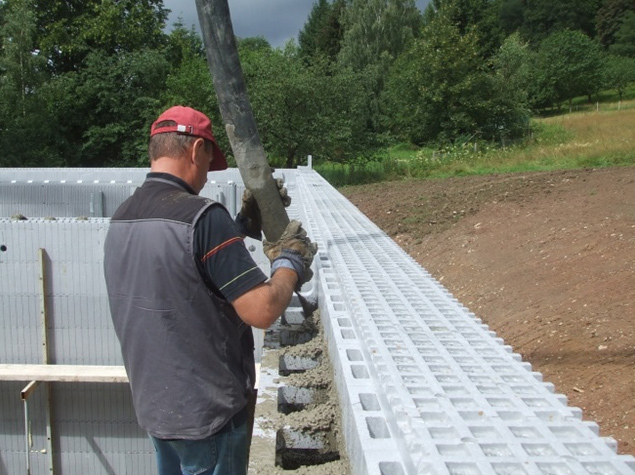 In order to reduce costs, it is possible to erect the walls on "layer-by-layer" basis: three layers of elements (75 cm) in one take which are then manually filled with concrete. 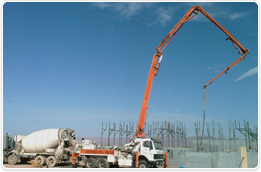 The concrete grade and reinforcement must be according to the building structural design. 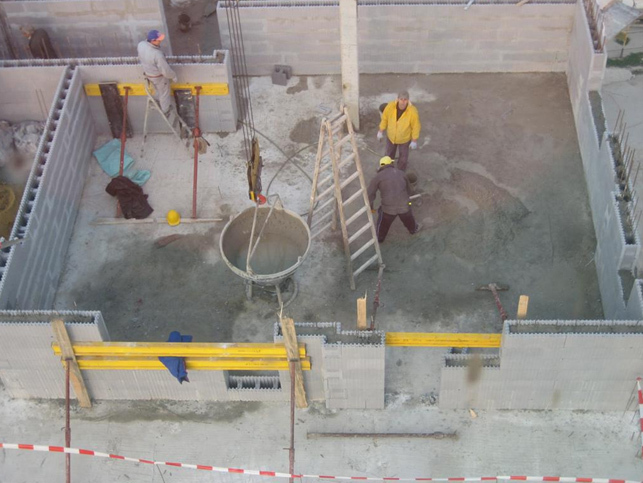 The concrete should be vibrated by rodding. 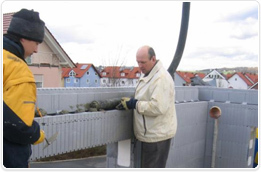 A special tray made of metal sheet is useful because it protects the locks which connect the elements from being contaminated with concrete. 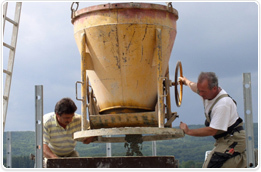 Manual concreting is rather time-consuming and requires supervision of an experienced instructor.